The Nourished Life is a 21 day program designed to help you achieve a sustainable approach to healthy living. The program is designed to help you overcome some of the most common roadblocks to healthy living by offering the tools, resources and support needed to streamline the process and set you up for lasting change. 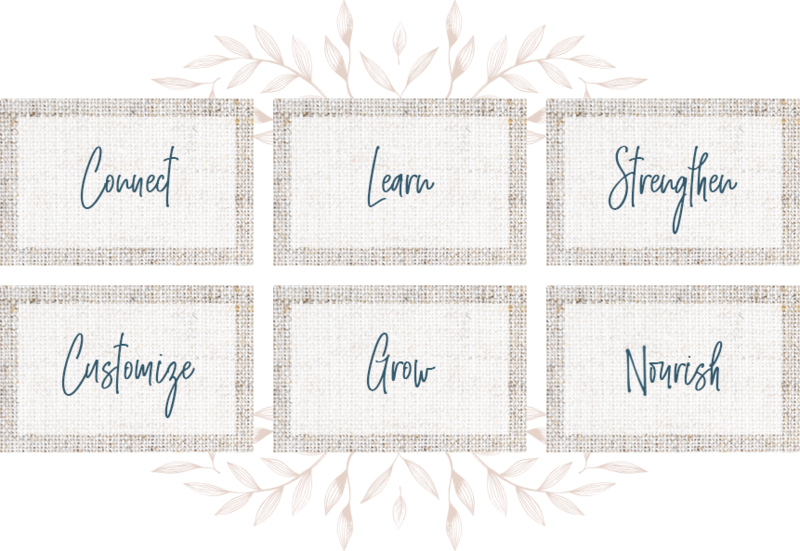 You will receive a packet of resources at the start of the program that provide the foundation for success in each of these areas. In addition, each week will be dedicated specifically to one of these areas to ensure your head knowledge becomes the action steps transforming your life. Weekly modules led by certified holistic health coach and physical therapist, Stacy Tarrh. These modules include video coaching sessions, achievable action steps, and other resources for success. Access to an exclusive library of 20 minute pilates workouts led by master trainer Ahmé Bovée. The pilates training videos are structured as virtual "private" 1:1 trainings on demand with Ahmé, and are available to you throughout the 21 day program. They have been created to be powerful resources in the areas of movement and self-care. Access to a private Facebook page that will keep you accountable with additional encouragement, support and a sense of community that comes through surrounding yourself with other like-minded people who are cheering each other on. You will gain immediate access to some of the course materials once enrollment is complete! Once you register, you will receive a welcome e-mail with course login information, and next steps. You will gain immediate access to the Welcome section of the program, which outlines the whole program, content release schedule, and includes several PDF resources that you can download and begin to look through. It includes an explanation of what each of the included items are and how you can begin to use them to set yourself up for success! You will be also be able to jump right in with Module One on Movement and can access the collection of Pilates workouts. This is when the fun begins! You will receive a new module on the first day of each of the three weeks. There will be action steps that Stacy gives in each video as well as e-mail check-ins and coaching tips shared in our exclusive Facebook community. The pilates workouts will always be available and you can enjoy the convenience of an amazing workout within your own home and built around your schedule. The bonus module will be released near the end of the third week and will provide a powerful tool for you to continue to check-in with yourself, track your progress, and progress in areas that still need work. Remember, this program is helping you build a sustainable healthy lifestyle that goes far beyond the 21 days! You will continue to have access to the private Nourished Life Facebook community where you can check-in as often as you would like, be inspired by other people in the group, and have access to Stacy, your personal health coach, for any questions that may arise. You will also have all the downloaded resources that you received at the start of the program to continue supporting your health journey. Stacy Tarrh, DPT, CHHC | Stacy earned her doctorate of physical therapy in 2006 and has spent over 10 years working as a clinician, a health and wellness advocate, and an educator both at the university level and within the community. In 2015, she enrolled at the Institute for Integrative Nutrition where she earned her certificate as a holistic health coach and began building the framework for a program that would empower people to take a proactive approach to life-long wellness. 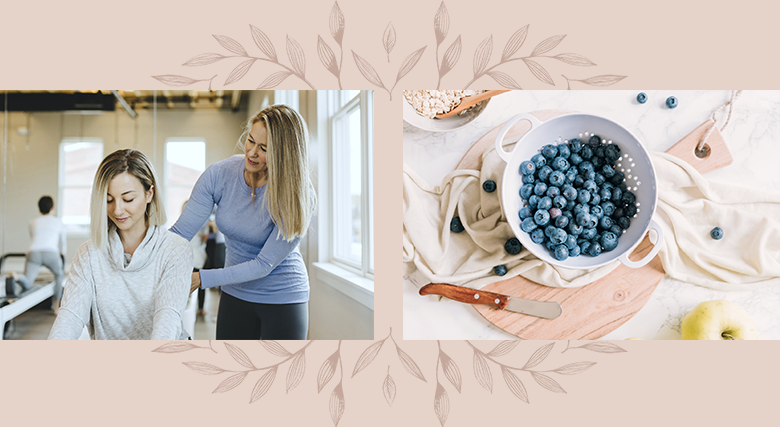 In The Nourished Life program, Stacy combines her knowledge as a physical therapist with her passion for holistic health to create a balanced and sustainable approach to healthy living. Ahmé Bovée, BA, CPT | A leader in health and fitness for over 20 years, Master Instructor, TV show host, and conference presenter, Ahmé inspires and mentors clients, instructors and studio owners across the country. Ahmé has founded two thriving Pilates Studios and has witnessed firsthand how Pilates can transform your life from the inside out. She has a Bachelor of Arts from the University of Guelph and is Pilates Method Alliance certified. As a Master Instructor for Balanced Body Education she offers comprehensive teacher training at her studio, Pilates in East, located in Grand Rapids Michigan, as well as traveling to teach. This program is a commitment to yourself and for yourself. You are investing in your own health and well-being by providing the plan, resources, support, accountability, and community that is needed to truly become healthy from the inside out.